lake of shining waters: Hibernation or???? That's what I'm asking myself. I have been hibernating from posting and for the most part, have not even been visiting my favourite blogs much! What's with this?? Honestly, I don't know. I love Blogging, I love visiting other Blogs, but lately I just have not had the energy to do so. The kids are on March break this coming week. I am not sure what we will be doing...probably some days trips, depending on the weather. We still have lots of snow in our yard. I've done some painting, I've done lots of stitching.....and I've moped around like crazy!!! I am tired of feeling like this, and hope I can shake this mood soon!! Anyone ever felt like this? I honestly don't know how to shake this "off" feeling that I have at the moment. 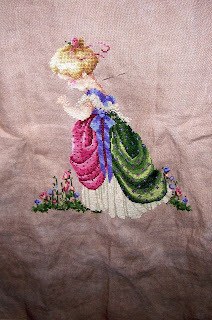 I'm leaving you with my stitching......I plan on hanging this in my entry way, when done. Not sure why the fabric shows like this! The fabric is actually taupe. I was going to say the same thing. I think it's the weather getting to you. Maybe you could take some extra Vit. 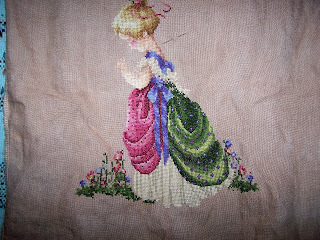 D.
I love your stitching, it's great and the colors are just so pretty. I love this design and your stitching looks great. I might be inspired to buy this chart now. Ah I love this pattern!I might just need to stitch it someday! Hang in there, I know the feeling! Hope you feel better soon! I think a lot of it is winter. We need some sun and nice weather. I also get that I "hide" at home when people are bothering me a lot, like stressing me out with their issues. Is it any of that? Or does it seem much deeper than that? The last few days around here it's been in the higher 40's-50's, so it's at least sweatshirt weather :) I got outside for a bit yesterday so that was nice. If the sun's out and shining bright, I don't care if it is cold outside, just having the sun shining in my windows keeps me moving and happy. Hope you feel like yourself soon! Marion, your stitching is just beautiful. Good job! Sure hope you feel better soon! Hopefully, it is the winter weather doing this to you. This is beautiful, Marion! I love this design. I wonder if the cure for your blues is sunshine. Hope you're back to normal soon. I am behind in visiting my favorite blogs as well. Life just seems to grab ahold of ya and not let go.